Anyone who has ever had a fish tank (especially salt water) knows how important it is and how challenging it can be to maintain the water at the proper levels to insure a healthy and happy environment for your fish. It’s so easy to develop harmful levels of pollutants (e.g. high levels of nitrates, ammonia and such) if you haven’t learned the steps necessary to test the water and how to make adjustments to create the proper balance. Worst yet, it’s so easy for harmful levels to develop simply because you don’t adhere to a prescribed maintenance schedule. I know because I am guilty of all the above. I didn’t know what I didn’t know until I lost several fish due to my neglect in learning soon enough. Hopefully, the ‘fish Gods’ will forgive me. How about you? Do you find yourself in the same situation when it comes to running your company? Are there areas of your operation in which you are just ‘winging it’ when you should be learning more about how to properly manage it? Are there skill sets you need to develop or activities you need to engage in more proactively (e.g. proper performance evaluation; marketing) that would help move your business to the next level? If you are like most small business owners, you brought quite a number of abilities and competencies to the job, but you would probably have to admit to yourself that you lack several that are critical to unlocking the hidden potential of your business. Why learn the hard way when there are many resources available to develop your skills and perhaps impact your view about such things? As a coach, trainer and consultant to small business owners for over four decades, I find that small business owners often can benefit from hands on guidance in a variety of areas that they take for granted but have never really received much training. Like myself with changing the water in my fish tank, they learn ‘the hard way’. Examples are: understanding and analyzing their financial statements, negotiating financing, handle employee performance issues, learning and applying Guerrilla Marketing techniques, improving production capacity and productivity, and developing their middle-management team. Sure, many do a ‘good’ job at these, but they never get to be ‘great’ at them. For the same reasons that great golfers have a coach, many small business owners would be wise to find the right coach to help them become ‘great’ in some areas where there is untapped potential. You can learn more about the many areas I am referring to in my new book, Set Yourself Free – How to Have A Thriving Small Business… And Enjoy It. concept that might surprise you but which should make some sense after you read what I have to say. I like to teach small business owners (SBOs) the art of ‘selective neglect’ to make sure they get the most important/valuable things done without unnecessary distraction by those things that have less/no value and which may have developed along the way. I use the term ‘selective neglect’ to describe ‘living with imperfection’ and I preach it all the time. It’s more than just reestablishing priorities or ‘picking your battles’. It’s almost a way of life for many overachievers within the SBO community if they are going to maintain their highly productive and ‘driven’ work habits. good thing. Likewise, I am not advocating for the almost disorder-like folks who can’t stay focused on any one thing for very long and have an insatiable appetite for ‘too many things at one time’. replacing one good idea (or a terrible idea) with a better idea so long as it’s not a constant dynamic that looks like a never ending game of ‘musical chairs’. Selective neglect enables the SBO to make a choice and remove the distraction of ‘unfinished business’ that can linger in the back of their head and be a distraction or source of unnecessary stress. If this notion of selective neglect seems a bit ‘out there’, you may want to learn more about it in my new book, Set Yourself Free – How to Have A Thriving Small Business… And Enjoy It! because you don’t have to have that ‘nagging feeling’ in the back of your head that does nothing good for you. P.S. If you’ve been faithfully following these blogs, you might have noticed that I ‘selectively neglected’ doing blogs for the last two issues. Yes, we’d all be millionaires if we got a dollar each time we heard this from others… or perhaps ourselves. How can one deny the reality of this when the actual workload is beyond our physical and/or mental capacity? It’s no excuse… just a ‘reaction’ to indicate that whatever else we are being asked to consider is simply not as important as what we already have on our plate. Most times it’s a valid response, but many times it’s just a knee-jerk reaction to feeling overwhelmed. I can’t count the number of times I have offered a business owner a great opportunity to promote their business for FREE on television (15-minute spots) or attend a powerful seminar that directly addressed issues of great concern to them only to be greeted with “I don’t have time.” We all know that one. I wonder what different choices owners would make if there was a tax for not considering what was being presented before they could use that phrase. It’s almost like a person who was drowning in a rip tide saying “I’m too busy to catch that” to the person who was asking them if they could use a life jacket! Yes, I know you’re probably saying to yourself, “Stan doesn’t really understand how many sales people and others would have me in a worse situation if I gave them my precious time.” True but what if I could give you a way to filter out such ‘wasters’ and look at ways to take advantage of those who could add value… to getting you out of the rut (rat race, rat trap, endless treadmill… call it what you want). Well then pay close attention if this interests you. a step further and suggest that most people have stuff that wouldn’t make a difference in the world if they NEVER did it! They just haven’t thought it through closely enough. If they did, they would either NEVER do it or simply delegate it to someone else and hope for the best. By doing this, they free themselves up to receive the ‘gifts from heaven’ to which they might have otherwise said “I don’t have time for that”. If you want to learn more about how to set yourself free, MAKE TIME to look at my new book, Set Yourself Free – How to Have A Thriving Small Business… And Enjoy It! because just might ‘earn’ some free time from it. Personality… You’ve got it! So what? That old song, Personality (1959), by Lloyd Price sure gets my feet moving and the words say it all. However, he wasn’t talking about just personality. Yet, isn’t that what we are looking for in the ideal employee … the right personality traits? Some say, “Hire for personality traits because you can teach skill sets” (assuming that person possesses the aptitude to learn those traits with proper training). I agree with the underlying basis of that statement yet many employers do little to assess those personality traits in candidates before hiring other than to guess from interviews. Even with several people interviewing a particular candidate, there is much room for bias, poor questioning, and poor listening by interviewers. And then there’s a candidate who can ‘play the personality’ during the interview and seemingly provide the right answers. Worse yet, many interviewers are looking for someone ‘just like themselves’ when what they really need (for the best fit) is someone who is NOT like them. Hiring the wrong people for the job (or good people who belong in a different role) is very common and the cost is much higher than most employers realize… because the cost is not just ‘wasted salary’ but the ‘opportunity cost’. 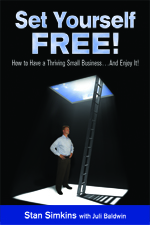 to Have A Thriving Small Business… And Enjoy It! I’ve taken some very complex subject matter suited to psychologists and philosophers and presented it in a practical and understandable format. You may not become an expert but you’ll surely have a working understanding that can be put to use immediately. I hope you will take a moment to read more about it. Feel free to call me at 518.369.7101 or email me. Drama… Small Businesses Should Have An Emmy Award! employees and poorly selected and lead employees (or owners). Be assured this is not an exhaustive list because the reasons are only as limited as the imagination and personalities of the participants. The number of possibilities becomes endless when you add the component of ‘family dynamics’ to the equation! not having a recruiting program that gives you choices to bring the right people on the bus. Many SBOs and their managers don’t realize they are ‘beating a dead horse’; i.e. trying to change people who have neither the capacity to perform nor the desire to behave in a productive manner. Terri Kabachnick, author of ‘I Quit But Forgot To Tell You, describes the ‘disengaged employee’ who is not unlike a zombie; i.e. you can see them moving about but they are not really ‘there’ at the same time. These folks take up space, contribute little… and often get away with it. If you feel trapped by people like this, then you may want to learn more about it in my new book, Set Yourself Free – How to Have A Thriving Small Business… And Enjoy It! because you do have choices and there is an effective process to get out of this dilemma. If you’re like most small business owners I’ve worked with, you probably find yourself wondering how it is that no matter what you say or do to clearly communicate, motivate and reward people, there is always someone who ‘drops the ball’. Oftentimes, the common REACTION is to consider such ‘bad behavior’ as either intentional, or simply unintentional neglect, oversight, or just attitudinal. systems; e.g. something as simple as a calendaring or contact management system… or the failure to use it! you EXpect.” At first I thought he meant I had to micromanage everything I delegated. What he meant was that there is a combination of things needed to avoid things slipping through the cracks: mindset, processes and systems. So I always recommend that everyone adopt the concept of ‘delegation’ (still owning the responsibility for the outcome) as compared to ‘relegation’ (washing your hands TOTALLY of it). Equally important, make sure you have a system in place that will provide periodic ‘follow up’ and/or feedback. This is especially true when you are working with someone with whom you have not had a lot of experience. No sense learning the hard way! You can learn more about this (especially in the section dealing with personality types) in my book, Set Yourself Free – How to Have A Thriving Small Business… And Enjoy It! because personality type is also part of the ‘human system’ that you need to work with.